I dont want be vip, i just want to know how you become. Mh-razen or bp give you vip or what tell me!!!! I am just as curious. The truth... is inescapable. The truth will always come out eventually, no matter what. And once the chains that bind the truth are severed... nothing can stop the truth from coming to light. VIP stands for Very Important Person. It means he/she has been a lot of help for LFE. One can't become a VIP without being capable of doing something, because VIPs usually have worked to earn their position. (E.G. I'm VIP at HFE because I translate the site, not "just cause".). Also, most of the former mods are VIPs (or maybe it's the other way around, VIPs become moderators. Dunno D=). (04-23-2012, 04:09 PM)Jerkington XIII Wrote: VIP stands for Very Important Person. It means he/she has been a lot of help for LFE. One can't become a VIP without being capable of doing something, because VIPs usually have worked to earn their position. (E.G. I'm VIP at HFE because I translate the site, not "just cause".). Or, to be more precise, every vip around here was either mod, global mod, or admin of LFE at some point in time. But not only that, quite a few have worked on the mainsite as well. 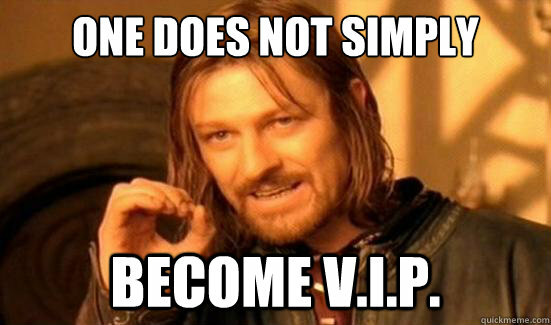 Generally, becoming VIP without any promotion inbetween is quite tedious. And we are currently not seeking for new moderators or anything the like. So yeah.... not any "new" VIPs in sight. I think donating will make you a VIP member. am I right BP? BP told you what this is about, so I'm gonna close this. Current time: 04-20-2019, 04:31 AM Powered By MyBB, © 2002-2019 MyBB Group. Theme created by Silverthorn.